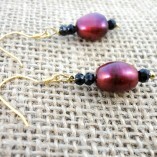 Striking black Spinel and Pearl earrings with a vintage retro feel. Some say that black Spinel is the stone for people born on Saturday and it is the recommended gift for the 22nd wedding anniversary. Pearls are the birthstone for February, April, June (traditional), July and November. and for the 30th Wedding Anniversary. 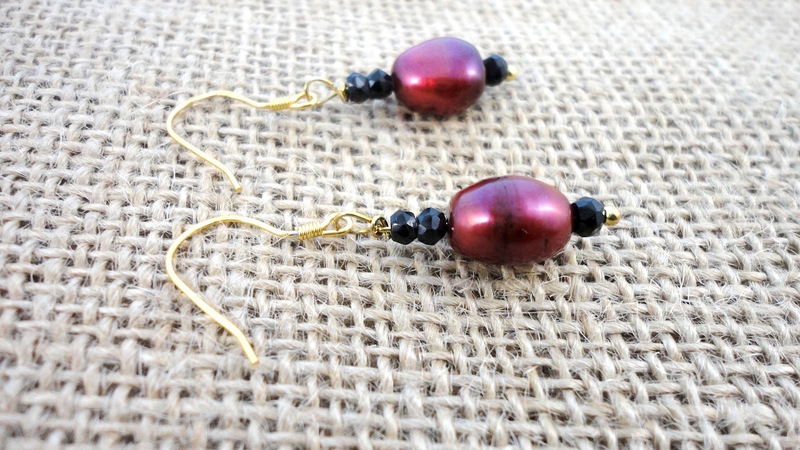 Striking black Spinel and Pearl earrings with a vintage retro feel. The sparkling black hand faceted Spinel is often referred to a the ‘black diamond’ and has been prized through the centuries. The 4mm micro facets of the spinel are beautiful and highly reflective. 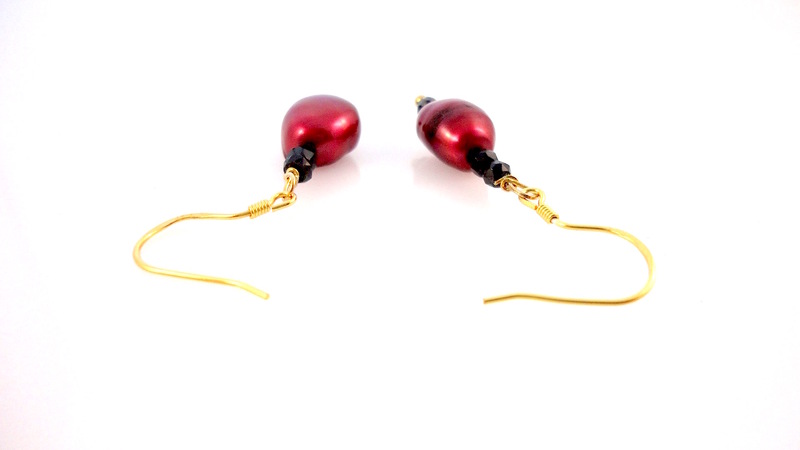 The rich 11mm mulberry baroque pearls are a substantial size and with a deep regal colouring, like a rare claret. 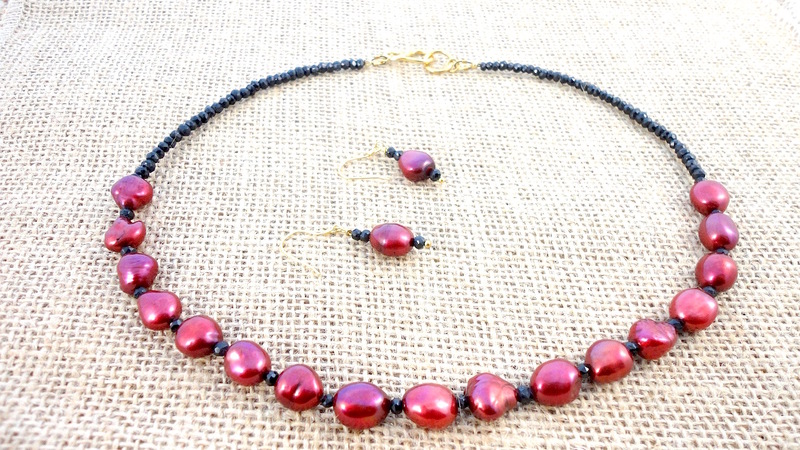 Baroque pearls have an organic shape and are a contrast to the more traditional round pearls. The shepherd hook is hallmarked 925 sterling silver which is gold plated adding to the sense of opulence. This earrings can be worn during the day but are stunning in the evening . 22mm drop from the top Spinel. An ideal present or just treat yourself. 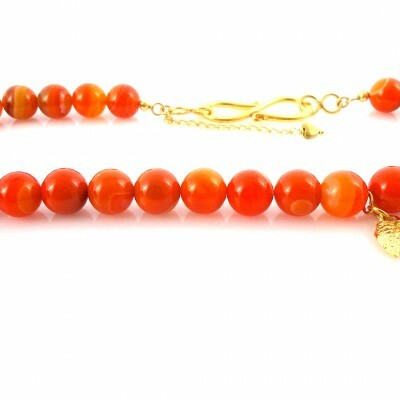 Why not check out the matching necklace. 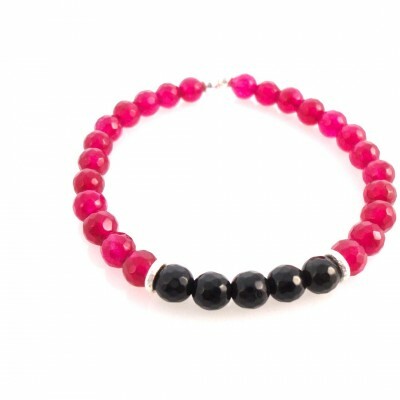 Spinel is associated with love and supposedly help the wearer to put his or her ego aside in devotion to another. 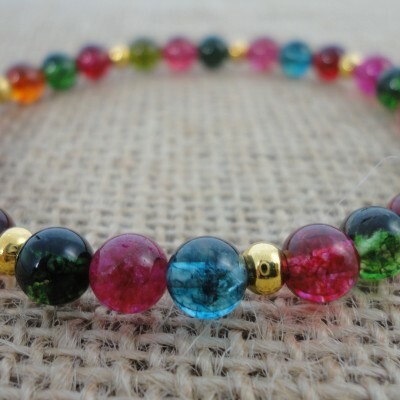 Spinel is also thought to encourage passion and increase the duration of life. Black Spinel in particular is said to be a protective stone that assists in re-establishing relationships and resolving issues. It is also believed to ease sadness. The spinel is known as the “great imposter” in the world of gemstones. For centuries red spinel was thought to be ruby. Several of the “rubies” in the Queen of England’s crown jewels are actually spinels one of which is the ‘Timur Ruby’. One of the most famous historical spinel gemstones is known as “the Black Prince’s Ruby”. It is set into England’s state crown and is held at the Tower of London. It first appeared in the historical records of fourteenth-century Spain, and was owned by a succession of Moorish and Spanish Kings before Edward, Prince of Wales—the “Black Prince”— received the stone in 1367 as payment for a battle victory. Elizabeth I even kept in her private collection. Birthstone :February, April, June (traditional), July and November,and for the 30th Wedding Anniversary. 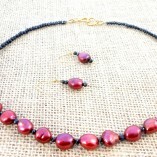 Pearls are believed to attract wealth and luck as well as offer protection. 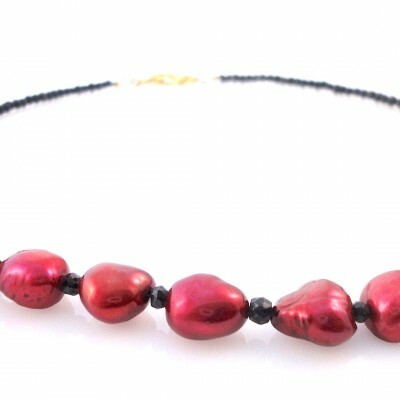 Known for their calming effect, pearls can balance one’s karma, strengthen relationships, and keep children safe. The pearl is also said to symbolize the purity, generosity, integrity, and loyalty of its wearer. One of the earliest accounts of pearls and weddings comes from the Hindu story of Krishna (or Vishnu), who plucked the first pearl from the depths of the ocean and gave it to his daughter Pandaia on her wedding day as a symbol of love, union, and purity.